Home - How to use it? The use of Your Gamify app is easy. Just follow the 4 (four) steps that are visible on right dashboard. 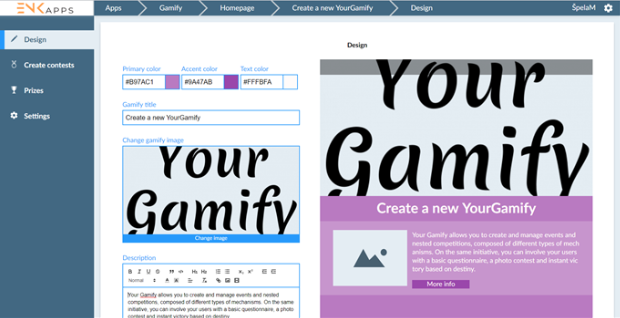 The design of Your Gamify app dashboard was made on a long customer experience basis. 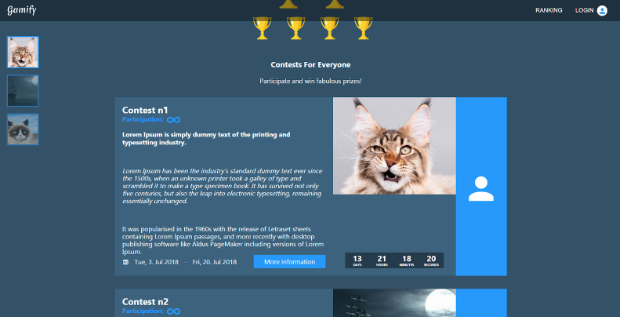 That is why the creation of Your Gamify starts with choosing the colors of the design, inserting the needed logo, pictures and text and create one or more contest. You choose the desired Primary, Accent and Text color. Then you type in the Your Gamify Title and Description. You also have to upload the picture that represents your Your Gamify. At the end you just fill your your contact data like: phone number, email and social media accounts. 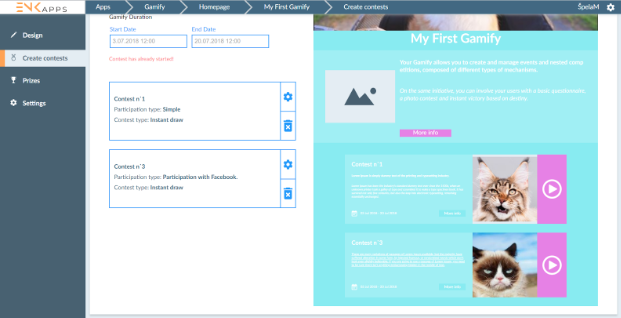 After you created the design you can already start creating and adding contests. You can choose between 4 participation types and 2 contest types. Simple – This participation type creates a rule of cooldown between each participation using the same participations type. You can edit the cooldown time. Unique codes – Unique codes participation happens only if unique code is given as the parameter and it is correct. Quiz – Only users that correctly answer all questions can participate. Facebook Users can participate with their Facebook account. Instant draw – User knows if they won a prize immediately after they participate in contest. 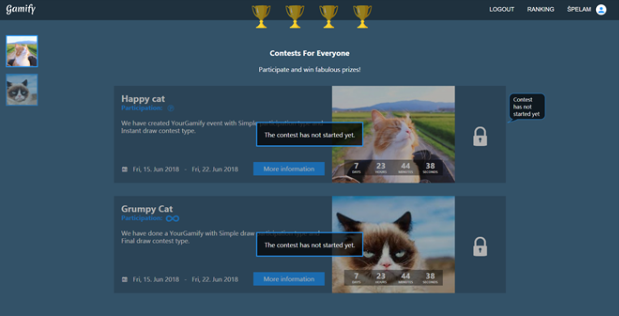 You can select multiple participation types after creating the contest. Final draw – Contest winners will be randomly selected when the contest is finished. 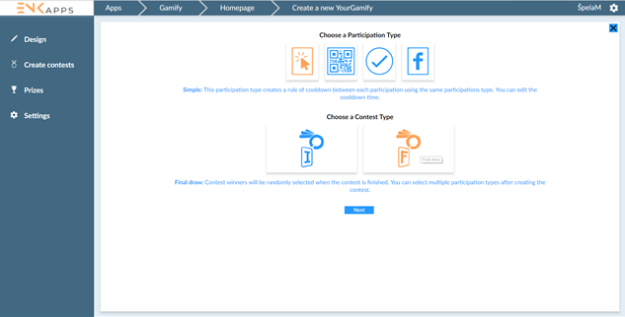 You can select multiple participation types after creating the contest. In the next step you fill out the contest information like picture, title, description, date and number of times the user can participate. We have created two contests in just a few minutes and here we can see them in the admin panel. Now it is time to set the prizes for our contest. Choose the “Prizes” tab on the right admin panel. 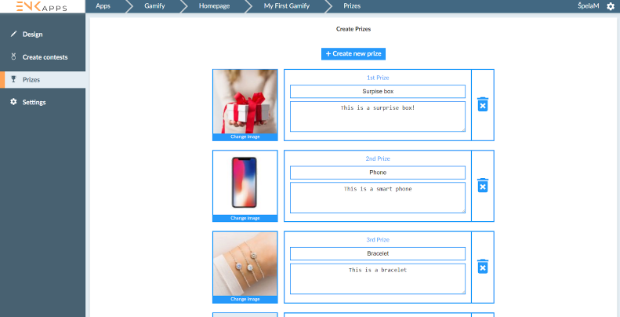 You will see a create prizes page with a blue button for creating new prizes. Just fill it with your prize name and description and upload the desired photo(s). Here you can also see the Your Gamify “Rankings” and by clicking on a user the system will display their personal information and all data related to Your Gamify. 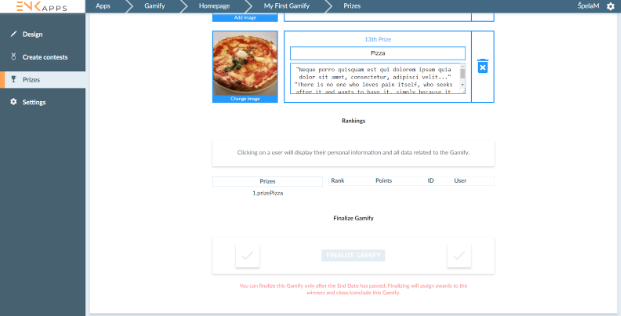 At the bottom of the page there is the option to “Finalize” your contest. You can finalize your Gamify only after the End Date has passed. Finalizing will assign awards to the winners and close/conclude the contest. The last step of Your Gamify is “Settings”. Here you can copy the link for Your Gamify and use it as you wish! You can also change your subdomain name or insert your Google Analytics code. This is it! We just finished our first Your Gamify in just a few minutes. Now we have our own web page with our own contest. Like a piece of cake! Your Gamify is a starting point for a new relationship and communication with potential customers or users interested in your brand. This is an innovative and unprecedented way to create the perfect audience for your business identity, which allows you to start a new profitable relationship with your customers.